13 days ago now, we put out our Delegation Campaign that outlined the benefits of delegating to @dstors. 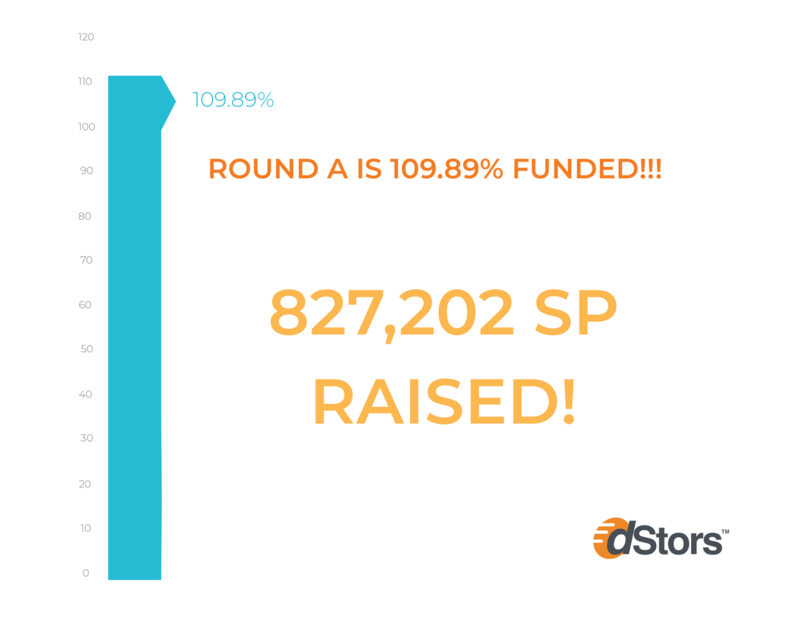 This morning during our dStors dev call, we watched the delegations reach near the Round A goal of 750K, then we watched the delegations blow past that towards 800K and now at the time of writing this post we are at 827,202 SP in delegations received from the community. The community is more than just excited for the potential that we are going to be bringing to the Steem Blockchain. The community is excited to get their hands on STORS tokens that will have value across multiple blockchains. dStors is the largest project on the Steem Blockchain that is not supported with Steem Inc delegation. Ever since @kaliju and I came out and publicly announced the @dstors project to everyone, we have see all sorts of support from the community. 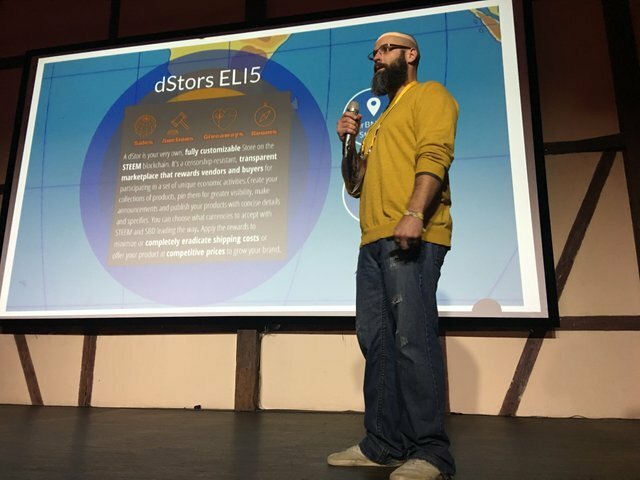 Since @roelandp gave me an opportunity to get on stage at Steemfest and present dStors to everyone, there has been so much excitement building from you all. As we near 1 million Steem Power in delegation, the team can not help but feel overwhelmed by the support from you all and the belief that you all have in dStors. We hope that @ned and the rest of the Steemit Inc team take note on what we are doing with dStors. There is a lot of FUD going around on the platform right now with big accounts powering down and people are wondering about the future of the Steem Blockchain. dStors is here to bring business to the blockchain. I think that there is a shift in the way that people are going to be using the Steem Blockchain over the next year. 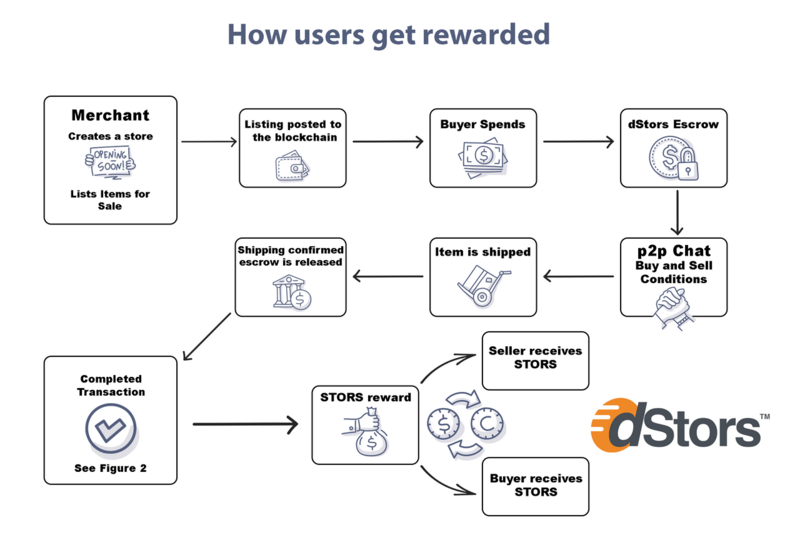 With dStors we are bringing incentivized shopping by giving the community the ability open their own stores on the blockchain. The sellers will be able to accept fiat or cryptocurrency via coinpayments. This will give everyone the ability to use their Steem or SBD in a new way, further increasing its value. What sets dStors apart from the current models that are already in place like eBay, Shopify, and Alibaba, is that once the transaction of sell is completed, our model does not stop there. 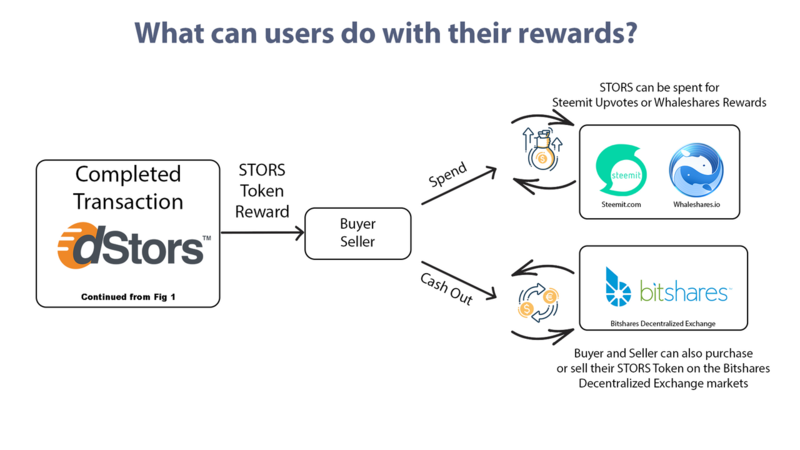 Both the seller and the buyer will then be rewarded with our STORS Tokens. Those tokens can be used for rewards on the Steemit or Whaleshares platforms or sold back to the Bitshares exchange. This incentivized shopping model is what will keep buyers and sellers interacting with the blockchain and will bring people from all over the world together and introduce them to not only cryptocurrency, but the Steem Blockchain as a whole. As more users are being on-boarded to the blockchain via dStors, more transactions will be broadcast across the chain further reinforcing the fact that the Steem Blockchain is much more advance than other blockchain in terms of transactions per second. I just want to say thank you to everyone in the community that has been a believer in dStors since @kaliju and I first started talking about it. Many people think that the Steem Blockchain is dying, but the dStors team is here to breathe new life into the blockchain. We hope that @ned, @andrarchy and the rest of the Steemit Team can see the value that we are bringing to the platform and the excitement from the community that is behind dStors. Make sure that you visit our dStors Open Forum post and ask us questions about the project for a chance to Steemmonsters Alpha Packs. Thank you for taking the time to learn a little something about us at dStors. We are looking forward to January. You can expect the launch of our Minimum Viable Product by then and begin interacting with your stores. Thank you all again for your amazing show of support. Did you guys work out a roadmap so we can follow up on our initial support? Such a great news for dStors, I will follow you guys for more updates! Love seeing things starting to happen, especially with projects like this. Seeing the bright future of e-commerce market worldwide and the @dstors transaction model with multiple payment option , and complete faith in Steem ecosystem I too delegated my part from my small wallet. Glad I made it too the all famous Group A. And love to be part of the next big thing on Steem Blockchain ......Steem on ! That is awesome that you were able to delegate and be part of the dCommerce revolution. Thank you. You know I always welcome you flags. They are just to let me know you are still thinking about me. We appreciate your support homie. Thanks man. I bet your store is gonna have some dope stuff in it. Congratulations! I am glad that I am one of the round A contributors. Thank you. Glad to have you as part of the delegators. It is much appreciated. Dstors is a game changer. I can't wait. dStors is here to evolve the way that the Steem Blockchain is being used. And it is the community that is helping to make that happen. Thank you for your support. It doesn't use the Steem Blockchain so how does it change it? Yes it does, for the 1000th time. Great Projects deserves great recognition! So glad because of your suceed guys!!! Thank you @leotrap. I still wish that we could have met each other at Steemfest this year. We will have to plan on the next one. Thank you for the support. Yo man! Think happens for a reason... But sure SF4 will be the time... Cheer and happy holidays for you, the tean and your fam! We are as well. 2019 is going to be a great year for the Steem Blockchain and for everyone on it. Amazing how Steemit Inc and @andrarchy have zero interactions with such positive ventures like dStors. Not even a single word of encouragement, never mind delegations! How silent the Whales have also been! Not all the whales. Some have taken note and have delegated. Because this project is not being built on the steem blockchain. The tokens are not issued from steem, but they are funding it with Steem delegations... And promises of future votes from the reward pool. I didn't know about this information. If you don't use the Steem blockchain, how is the first e-commerce company in Steemit? If they are not going to rely on the Steem platform, then there is no record of transactions that can be monitored by witnesses. None of it is on a blockchain. They are launching an external website that doesn't interact with the steem blockchain the tokens will be on Bitshares. 80% of Dstore tokens go to Dstore. 10% of Dstore tokens go to Bitshares. 10% of Dstore tokens go to SP Delegators, Gifting, Drops & Shares. This has less than 10% to do with Steem. However they have presented it as a Steem App. Excuse me? I thought I made it clear and you replied in acknowledgement? Because this project is not being built on the steem blockchain. Are you a developer and can see my code? Please don't assume, that's ridiculous. is the code open source? What elements will you include on the blockchain... Everyone sees you now and the funny thing is... When I made my post.... I just wanted one answer. Glad to be a part. Woohoo! We are glad that you are a part as well. Thank you for the support. I love what you guys are building but your behaviour towards people asking critical questions about your project is quite simply disgusting. You’re going about flagging people who just want to better understand your business model, how your project really benefits Steem and your motivation. You are not behaving like community focused people. Which is a real shame since I genuinely love your project. But I can’t and won’t support a project where the founders act like children. Who is flagging? dStors? Me? Don't mix it up. Talking to the founder here. DYOR. Yes, dStors. And the founder is responsible for the behaviour of their team. Did you Author the White Paper? Lot's of interesting things in the white paper. Everyone please read it. Thanks a lot for sharing this info with us and for your advice about the quality of content. It's one of the most important things for Steemit platform success is the quality, as if there is a high-quality content that will attract more audience and more entrepreneurs and agencies to start using steemit and promote their products here as they do on other platforms such as Instagram or Reddit. it's a relief that there's still positive things happening in the crypto community. looks like everyone will win here. There are great things happening all over in the crypto community. You just need to know where to look. Innovations are happening all the time. Even though the markets are low across the whole crypto market, amazing things are happening. Is the Round A still open or do I need to wait for the 2nd round to delegate some SP? Stay tuned for the official updates from the @dstors account for that information. Where could I read a dstors whitepaper? You can find it at https://dstors.com/ or you can read more about us on the official @dstors page. This post has received a 91.11 % upvote from @boomerang. Looking at the amassed delegation, how you gonna adjust the excess steem Power delegation? Will they be shifted or waitlisted for Round B or allow them to make way in Round A itself ? Is there a link or do you accept also smaller deleions 20-50sp? Those delegations will need to be done manually via steemworld.org or other means. In order to receive STORS Tokens for your delegation, there is a 500 SP delegation minimum. @dstors will give minnows a new way to utilize the Steem blockchain. We are giving everyone the ability to open your own store and become an entrepreneur. With each transaction, the buyer and seller will earn STORS that can be redeemed for rewards which can be worth more that what many minnows are generating in post rewards from blogging in the conventional ways over the course of weeks. This sounds cool. I read today many of your posts and thats why i was so excited. By the way i am also a small online seller and i think this option can be a good solution in a places like philippines example where the online seller are useing the facebook as a trusted place and they make the payments via western union and similar companies but still have a big risk because of the endless numbers of scammers. 2019 will be a big year for the Steem Blockchain with @dstors leading the way. Congratulations 🏆 keep up the good work! They will have no immediate ties to Steem just like dlive. The tokens are issued on Bitshares, the site does not interface with the blockchain and they are absolutely funding this via the Steem community, and promising in return for delegation upvotes from the Steem Reward pool for a token that will reside on Bitshares and a product that does not yet exist . STORS Token was issued on Bitshares because we can use it across multiple blockchains. Why should a project halt production and wait for SMTs to be released when something is already in place that can be used on the Steem Blockchain, the Whaleshares Blockchain and other blockchain if we expand to them as well? There are other projects on the Steem Blockchain that are currently in production as well such as @chibera. 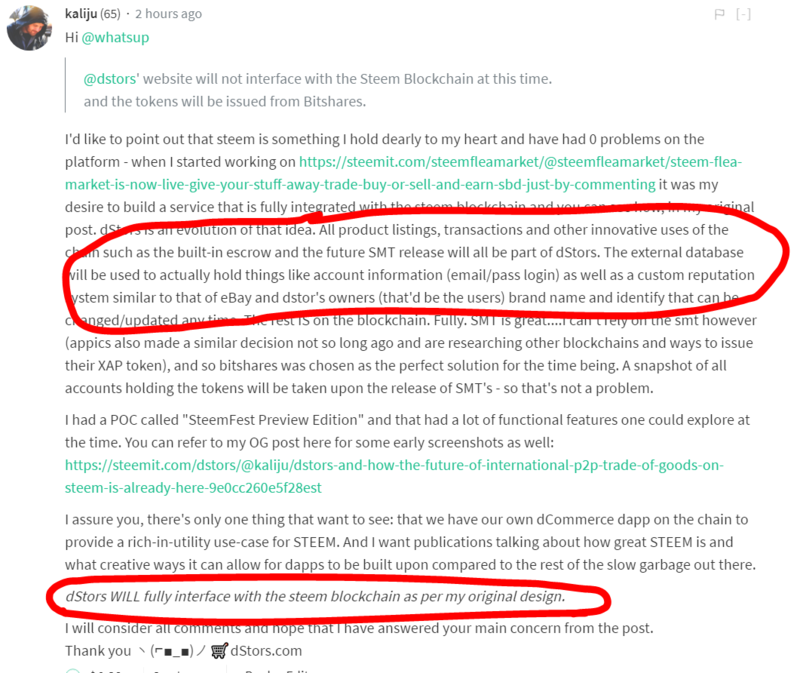 Are you running around on their posts spread FUD because they have delegation and don't have a completed product? Do you plan to switch to SMTs if/when they are released? That's great. I will look into it more. I can a see big potential with digital products like gift cards, gaming cards, gaming items, etc. Good luck, I hope this becomes a big success. They shouldn't wait for SMTs and it's a shame, but it doesn't change the fact that they are funding it on promises of future upvotes from our reward pool. The white paper is littered with mentions of Whaleshares. Why not fund it there. FUD? I call it the truth. Because, well it's the truth. Chibera is a 100% Steem based product, also there is more than a few people who're involved with coding the backend of Chibera or have read the code and audited it because the projects backend will be opensource. Chibera has provided content and showed continued progress, showed code, the backend running and much more. Please refrain of trying to pull us into your problems in the future. The Round B delegation benefits for @dstors are still very lucrative as well. Round B will yield a 2:1 ratio of STORS tokens per SP delegated. Yes, hoping to get some more Steem before the price goes up even more! It's a good sign for Steem, but want to get as much Steem as I can when it's below at least $0.50. @dstors is all about anti-FUD, lol. We believe in the Steem Blockchain. That is why we are passionate about introducing our proof of business model to the existing proof of brain. We believe that there needs to be more ways to utilize the blockchain. Please tweet that gif thing about the transaction speed daily. I and others will rt it. This is my twit list of steemers with 450+ of us on it. I think you are one of them. That graph gets rt's by crypto people whenever I see it and rt it. This is a key benefit people care about out there. Shame you don't lower the minimum to say 100 or 50! I would definitely do it then. Amazing! not sure what you were talking about when we mentioned projects yet this is very impressive and I will commit to shopping primarily through a @dstors stores before any other online store! #Nexty coin now has app wallet, you can download in CHPlay or Appstore. Every Nexty transaction (NTY) takes only 2 seconds and no transaction fees. Thank you @penssif. You are doing amazing things within the community.